Sophisticated, beautiful, and boozy. Sofitel's The Green Room is one of Wellington's few dedicated gin lounges. 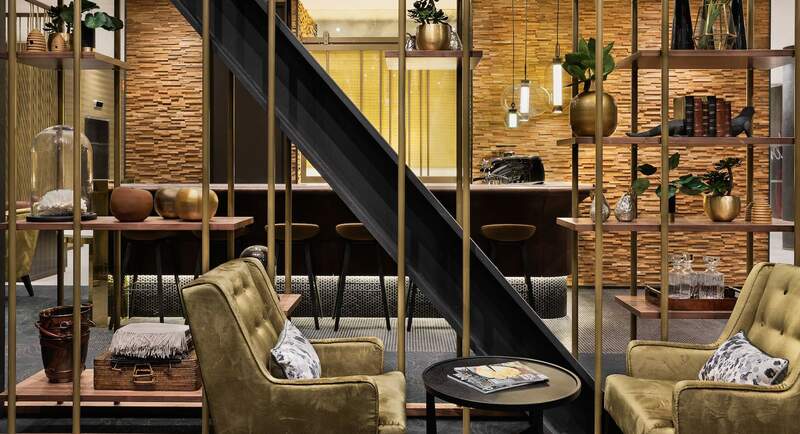 A little bit sultry, the mingling of greens and golds, leathers and velvets, will make you feel like you're in a chic alcove of civility, far removed from the hectic pavements of Courtenay Place. Take a seat at the bar, or perhaps a cozy nook in the corner admiring the view from the floor to ceiling windows, and settle in. Looking around, you'll see gorgeous couples revelling in bottles of Veuve Clicquot, or business people swirling glasses of rich, golden whisky, but whatever you do, don't overlook the gin. Partnering with East Imperial, New Zealand's premier maker of tonic, the gin menu has been curated by them exclusively for The Green Room — and the results are mouthwatering. Think fresh, fruity ingredients expertly paired with a range of top-shelf gins, botanical and refreshing, these concoctions will dance on your tongue. Start off with a Perrenial Tonic ($18): a gin-heavy drink with a citrus bite, hints of grapefruit and a lemon-infused gin make this an easy and relaxed cocktail to start the night off. Follow on with a Splendour in the Gardens ($18), an unusual and unique tasting mixture of berries and bitters, topped of with a traditional tonic. If you're feeling spicy, then the Bloom Bay Highball ($18) is for you. With ginger beer, Martinborough made Lighthouse Gin, manuka honey, and a serious kick of coriander, you'll be ready to get off of your seat and onto the dancefloor. As a nightcap, I suggest Old Buckie ($18), a sweet and refreshing cocktail of gin, bay leaves, fresh lemon juice, and Thai ginger ale. The Green Room is perhaps the coolest lounge in Wellington. Relaxed, casual, and luxurious, you'll laze the day away in ultimate style.